Arlington Officers Save Lives in 3-Alarm Fire | NOT IN MY WORLD!!!! 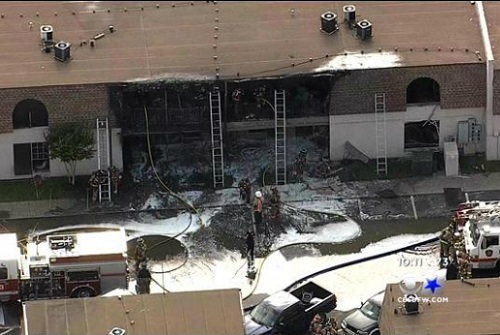 Arlington, Texas – Two Arlington police officers are being credited with helping to save the lives of several residents of a burning apartment complex Tuesday. A three-alarm fire was reported about 5:15 p.m. at the Woodland Park Apartments in the 2100 block of Valleywood Drive. The two Arlington officers were in the area investigating an unrelated disturbance call, according to police, when they saw the smoke and went to investigate. The officers – identified as Officer K. Johnson and Officer B. Cruz, according to an official police department release – “went inside of multiple units to ensure everyone was getting out safely,” police said. Inside one of those apartments, Marci Savill was sleeping, along with her children – ages 4 and 18 months. Two doors down, neighbor Chris Partlow told NBC 5 he was walking back to his apartment from a nearby laundromat when he saw the smoke. Partlow stood and watched as members of the Arlington Fire Department took control of the flames, holding on tightly to the twins, MJ and Lauren, dressed only in their diapers. “These two right here are safe now. That’s all that matters,” Partlow said. Officers Johnson and Cruz were each taken to an area hospital for treatment of smoke inhalation. “The officers entered the structure, into the smoke without breathing apparatus and were overcome by the smoke,” Arlington Assistant Fire Chief Bill McQuatters said. The cause of the fire is under investigation, according to McQuatters. Multiple residents of the apartments reported that their smoke detectors did not sound at any point during the fire – something the fire department is investigating. The fire destroyed four units of the 16-apartment building, according to the fire department. All 47 people who live in the building were kept out of their home Tuesday night, until power and other utilities could be restored. Teams from the American Red Cross-North Texas Region responded to assist the residents with food, clothing and other immediate needs, according to Anita Foster of the Red Cross, including shelter for those who cannot find an apartment within the same complex.